De man in't hembd, of de gefnuikte hoogmoed. 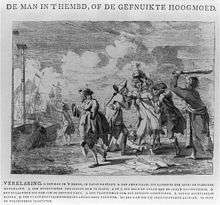 Print shows a man in a nightshirt (representing England) being attacked by several men (representing the countries of the armed neutrality league and the allies), he is held by a Swede and a Dane, a Frenchman places a foolscap on his head, a Dutchman places shackles around his ankles, an American runs away with his clothes, and a Russian is about to hit him with a club; in the background, a merchant fleet sails out to sea (British Cartoon Prints Collection). The phrase "armed neutrality" sometimes refers specifically to one of the 'Leagues of Armed Neutrality'. The First League of Armed Neutrality was an alliance of minor naval powers organized in 1780 by Catherine II of Russia to protect neutral shipping in the War of American Independence. The establishment of the First League of Armed Neutrality was viewed by Americans as a mark of Russian friendship and sympathy. This league had a lasting impact of Russian-American relations, and the relations of those two powers and Britain. It was also the basis for international maritime law, which is still in effect. In the field of political science, this is our first historical example of armed neutrality, however, scholars like Dr. Carl Kulsrud argue that the concept of armed neutrality was introduced even earlier. Within 90 years before the First League of Armed Neutrality was established, neutral powers had joined forces no less than three times. As early as 1613, Lubeck and Holland joined powers to continue their maritime exploration without the commitment of being involved in wartime struggles on the sea. The Second League of Armed Neutrality was an effort to revive this during the French Revolutionary Wars. It was an alliance with Denmark-Norway, Prussia, Sweden and Russia. It occurred during 1800 and 1801. The idea of this second league was to protect neutral shipping from the Royal Navy. However, Britain took this as the alliance taking up sides with France, thus attacking Denmark. The alliance was forced to withdraw from the league. A potential Third League of Armed Neutrality was discussed during the American Civil War, but was never realised. Switzerland and Sweden are, independent of each other, famed for their armed neutrality, which they maintained throughout both World War I and World War II. The Swiss Confederation has a long history of neutrality—it has not been in a state of war internationally since 1815—and did not join the United Nations until 2002. It pursues, however, an active foreign policy and is frequently involved in peace-building processes around the world. The United States had proclaimed a position of armed neutrality from the beginning of World War I, in the summer of 1914. This became an increasingly unpopular stance, especially after the German forces sunk the British passenger ship RMS Lusitania in May 1915, which killed 1,201 people, including 128 Americans. In early 1917, German forces took the conflict to new levels by engaging in unrestricted naval warfare. This resulted in the sinking of the American cargo ship, the Housatonic. Wilson broke off diplomatic ties with Germany that same day. The final straw is said to have happened on April 1, 1917 when German naval forces torpedoed the U.S. steamer Aztec. Twenty Eight of its crew members drowned. American forces maintained neutrality during World War I until President Woodrow Wilson's War Message on April 2, 1917. Wilson delivered his historic war message before Congress. Spain also maintained neutrality throughout both World War I and World War II. While Spain did lean slightly towards the Axis, as evidenced by the Blue Division, it did not join World War II. During World War II, it was believed that Ireland would take the German side if the United Kingdom attempted to invade the State, but would take the United Kingdom's side if invaded by Germany; historically, it is now known that both sides had in fact drawn up plans to invade Ireland (see Irish neutrality). Ireland was outwardly neutral during the conflict, but did make some concessions to the Allies by sharing intelligence and weather reports, as well as repatriating downed RAF airmen. ↑ Oppenheim, International Law: War and Neutrality, 1906, p. 325. ↑ "Armed Neutrality". Dictionary.com. Retrieved 27 April 2014. ↑ "Armed Neutrality Law & Legal Definition". USLegal. Retrieved 27 April 2014. ↑ "Armed Neutrality". Oxford University Press. Retrieved 27 April 2014. ↑ See, generally, Scott, The Armed Neutralities of 1780 and 1800: A Collection of Official Documents Preceded by the Views of Representative Publicists, 1918; Karsh, Neutrality and Small States, 1988, p. 16-17; Jones, Crucible of Power: A History of American Foreign Relations to 1913, 2009, p. 15-17. ↑ Vinarov, Mikhail. "The First League of Armed Neutrality". CiteLighter. Retrieved 2016-04-21. ↑ See, generally, Scott, The Armed Neutralities of 1780 and 1800: A Collection of Official Documents Preceded by the Views of Representative Publicists, 1918; Karsh, Neutrality and Small States, 1988, p. 17. ↑ Bienstock, The Struggle for the Pacific, 2007, p. 150. ↑ Bissell and Gasteyger, The Missing link: West European Neutrals and Regional Security, 1990, p. 117; Murdoch and Sandler, "Swedish Military Expenditures and Armed Neutrality," in The Economics of Defence Spending, 1990, p. 148-149. ↑ "Switzerland - Knowledge Encyclopedia". Knowledge Encyclopedia. Retrieved 27 April 2014. 1 2 "Woodrow Wilson asks U.S. Congress for declaration of war.". The History Channel website. ↑ Burke, Dan. "Benevolent Neutrality". The War Room. Retrieved 25 June 2013. ↑ Joe McCabe (1944-06-03). "How Blacksod lighthouse changed the course of the Second World War". Independent.ie. Retrieved 2016-04-21.